NASA’s New Horizons spacecraft is probably best known for the high resolution photos of Pluto that it took back in 2015. But on January 1, New Horizons will fly past an object even more distant than Pluto called Ultima Thule. Astronomers are preparing to learn more than ever before about these worlds lurking on the edge of our solar system, and according to new data from the spacecraft they won’t even have to wait until the new year to start: Ultima Thule appears to not have a light curve, which is perplexing scientists. New Horizons doesn’t arrive at Ultima Thule for another week, but that doesn’t mean the spacecraft gets to just relax until then. New Horizons has been busy taking photos and measurements of the asteroid to try and learn everything it possibly can about its destination before the big day. That can be challenging because even though the asteroid is so close, it still appears as nothing but a big bright spot to the spacecraft’s cameras. However, scientists can still learn a great deal from that one bright spot by measuring what’s known as a ‘light curve.’ Asteroids like Ultima Thule reflect sunlight—that’s why they’re bright spots instead of dark spots—but the amount of light they reflect depends on how much of their surface is facing the Sun. The bigger their surface area, the brighter they become. Small asteroids like Ultima Thule aren’t perfectly round, which means how much of their surface is facing the Sun changes as they rotate. This means that over the days and weeks that New Horizons has been watching Ultima Thule, it should see the asteroid get periodically brighter and dimmer. This information can tell scientists about Ultima Thule’s size, shape, and speed of rotation. But Ultima Thule isn’t changing its brightness at all. New Horizons has been watching Ultima Thule for three months and hasn’t spotted any brightness change, which is really odd. Ultima Thule is definitely not spherical—astronomers determined that a year ago—so why doesn’t its brightness change? There are a few possibilities that scientists have already raised, but none of them are particularly compelling. It’s possible that New Horizons is lined up with Ultima Thule’s axis of rotation, so that it’s looking at the asteroid’s north or south pole. If this was true, it would explain the lack of brightness changes, but it would be one pretty big coincidence. Another possibility is that Ultima Thule is surrounded by dust or small moons that even out its light curve, but this explanation has problems too. Some solar system bodies like comets do have clouds of dust surrounding them, but that typically only happens when they heat up near the Sun. Ultima Thule is cold and dark and shouldn’t have any dust. It could still have a collection of small moons, but that would make it unlike anything else astronomers have ever seen. Fortunately, we might not have to wait long for an answer to this problem. Ultima Thule, officially named 2014 MU69, is 1 billion miles (1.6 billion km) past Pluto, and New Horizons’ approach will be the farthest solar system encounter ever undertaken by human spacecraft. By studying the object, researchers will learn about the earliest days of the solar system — of which Ultima Thule is likely a deep-frozen relic. From observations so far, researchers think it’s reddish-colored and about 23 miles (37 km) wide, but they’re prepared to learn a lot more after New Horizons takes a look. Ultima Thule may even turn out to be two objects orbiting a common center of mass. The free Pluto Safari app let New Horizons fans track the probe’s flyby of Pluto in 2015, and now it’s set to follow the journey past the distant body Ultima Thule on New Year’s Day. The New Horizons team confirmed Dec. 18 that the spacecraft was on target to fly within just 2,200 miles (3,500 kilometers) of the frozen object at 12:33 a.m. EST (0533 GMT) on Jan. 1. That’s even closer than the probe approached Pluto — it passed that dwarf planet within 7,800 miles (12,550 km). Pluto Safari, which can be downloaded here for iOS and here for Android, lets users access interactive views of the solar system as New Horizons approaches Ultima Thule, view a countdown timer of the spacecraft’s closest approach, down to the second, and read the latest news about the flyby. 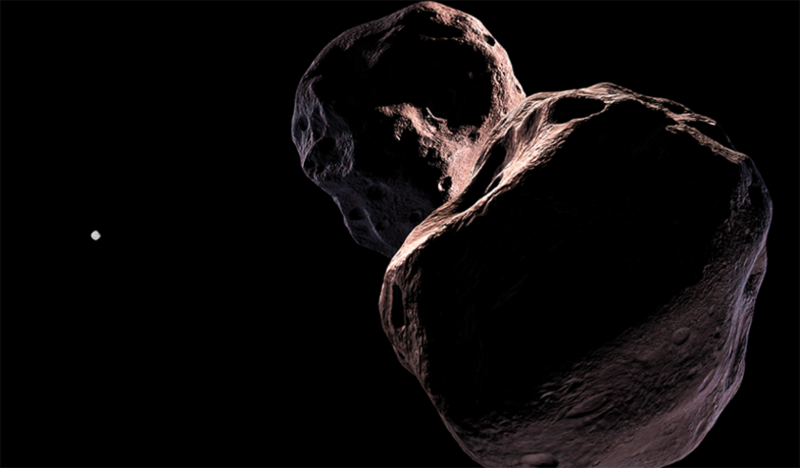 The app also lets users virtually fly by some objects in the Kuiper Belt, the band of icy objects where Pluto and Ultima Thule make their homes. Users can also navigate a 3D model of Pluto’s system, and one of New Horizons itself, as well as learn how to pinpoint the location of Ultima Thule in their night sky.